Program Management & Testing - Pagnotta Engineering, Inc.
PEI has delivered many turnkey solutions to our customers. These projects require careful program management from conceptual design through manufacturing, assembly, and acceptance and structural testing. PEI works closely with our manufacturing partners to ensure that the end product meets all requirements, is delivered on time and within budget, and passes all acceptance and structural tests. 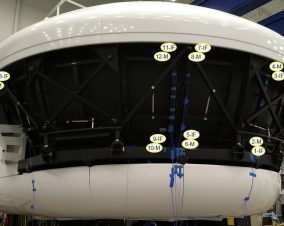 Perform vibration testing on a motion based flight simulator with large field-of-view glass mirror display. Test results are used to assess system stiffness, ensure no resonant frequencies below 20 Hz, and to tune the finite element model.